Have you heard about Listerine mouthwash being used as a mosquito repellent? There are lots of old wives’ tales around which tell us about different ways to keep mosquitoes away. Obviously, there’s no perfect mosquito repellent, otherwise, no-one would need to visit this website! But maybe there’s more to Listerine mouthwash than meets the eye. In this blog, I look at why Listerine is supposed to repel mosquitoes and soothe bites, and whether there’s any truth to its magic, mosquito-busting powers! If you’ve ever been on a mosquito’s menu, you want to make sure it doesn’t happen again. You’ll probably try anything once if it means you can avoid getting bitten. So when I heard about Listerine or other mouthwashes being used to keep mosquitoes away I thought I’d look into it. Is this just another sales ploy to make people buy a product, or is there really something to this story? Can the use of a mouthwash really stop mosquitoes from biting you? Does Mouthwash Keep Mosquitoes Away? Mouthwashes like Listerine usually contain essential oils, which are often used to keep mosquitoes and other insects away. Listerine mouthwash contains peppermint, thyme, wintergreen and eucalyptus oils which have been proved to work as mosquito repellents. Mouthwash can be applied the skin, but is very drying. Mentha piperita: Or peppermint oil. Applied at least every 150 minutes, peppermint essential oils will keep most mosquitoes at a distance. Gaultheria: Otherwise known as wintergreen oil and contains methyl salicylate. This also repels mosquitoes, but hasn’t been studied in detail. However, you need quite high concentrations of the stuff and the smell is quite strong. Thymus magnus: Or thyme oil. Contains a lot of thymol, which keeps most mosquitoes away. Studies show that in combination with natural vanilla, thymol will keep mosquitoes away for up to 120 minutes. Eucalyptol: Or eucalyptus oil. One of the best know mosquito repellents, eucalyptus oil contains large amounts of 1,8-cineole which is the main repellent chemical. But strangely, the essential oil works better at keeping skeeters away than 1,8-cineole alone. How Do You Use Listerine For Mosquitoes? To stop getting bitten by mosquitoes, you are supposed to use Listerine as a spray for the home, or apply it directly to your skin. Using Listerine as a mouthwash to repel mosquitoes does not work long-term. Listerine does repel mosquitoes, but needs to be reapplied or sprayed at regular intervals. You can pour Listerine into a spray bottle and spray it around the home. Alternatively, other people use cotton balls to apply Listerine directly to their skin. Just using Listerine as a mouthwash will not act as a repellent for mosquitoes. The other methods do repel them, but not for long. It is only high concentrations of the essential oils in Listerine that work as repellents. Mosquitoes don’t really mind the alcohol as it quickly turns into vapor and disappears. So to benefit from the mosquito-repellent power of Listerine, you have to spray or apply very regularly – at least every 10 to 20 minutes. This makes using Listerine as a mosquito repellent both expensive and time-consuming. Does Listerine Help Mosquito Bites? Listerine temporarily relieves itchy mosquito bites. This is due to two effects. First, Listerine contains large amounts of alcohol. 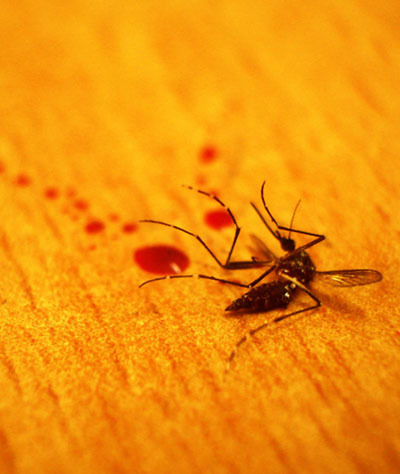 When applied to a mosquito bite, alcohol cools and soothes the inflamed area. Listerine also contains anti-inflammatory essential oils, meaning less of a reaction to a mosquito bite. Listerine was originally developed as an antiseptic for operating theaters. In fact, Joseph Lister, who discovered that some products (antiseptics) fight infection, gave Listerine its name. It was used to clean floors, as a cough medicine, and even to treat gonorrhea! Only later did it become a mouthwash. And somewhere along the way, people began to realize that Listerine mouthwash kept mosquitoes away. Sometimes. They also applied it to mosquito bites when the smell didn’t last long enough to keep the skeeters away. And it helped. Of course, there are plenty of other natural products you can use to treat mosquito bites. But if all you have to hand is a bottle of Listerine, that will do! 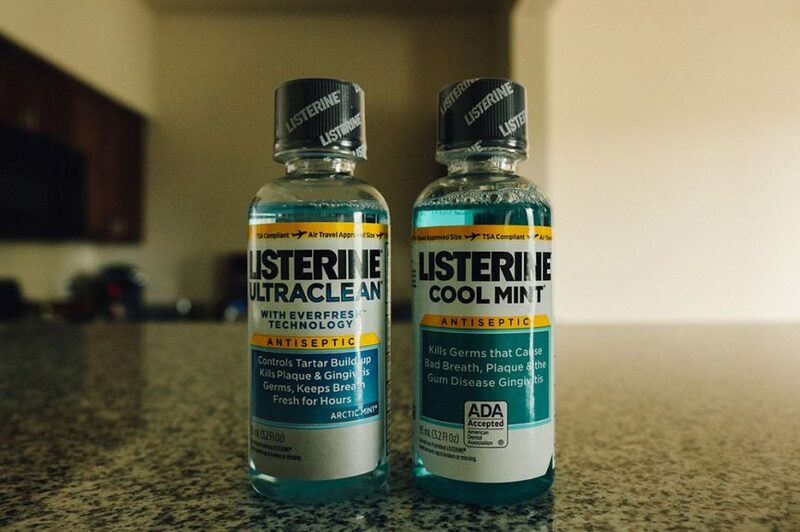 Original Listerine is a mixture of alcohol (27%), eucalyptol (0.092%), menthol (0.042%), methyl salicylate (0.06%) and thymol (0.064%). The rest is water. Essential oil percentages are very low in Listerine and don’t repel mosquitoes for long. Listerine mixtures for mosquitoes need to be reapplied regularly. Homemade mosquito yard sprays are easy to make according to tried and tested recipes. Yard sprays made in the home often have fewer chemicals and are more concentrated. This means they keep mosquitoes away for longer. Typical homemade mosquito spray recipes use citronella, clove, peppermint and thyme essential oils. Make your own homemade yard spray and keep the mosquitoes at bay! Because the following recipe doesn’t include alcohol which evaporates quickly, it will last! Using essential oils and a carrier oil is also important. The scents repel mosquitoes, and the oil means your yard spray will stick to surfaces and last so much longer. This homemade yard spray recipe won’t harm your plants, your pets, or you, either! You can spray your garden furniture. Or plants or trees near seating or barbecue areas. You can even spray your pets (be careful of their eyes!). Find a small 250 cc (or less) spray bottle. Rinse your spray bottle well. Fill the bottle ¾ full with distilled water. Add 4 tablespoons of carrier oil such as sweet almond oil or neem oil. Add 1 teaspoon of natural vanilla essence. Add 30 drops each of any of the essential oils listed below. Choose as many as you want. Shake the bottle very well, and spray! Store the bottle in a dark, cool place. I’ve already talked about some of the best essential oils we can use to keep mosquitoes away. Some of them don’t smell very good. Some people really don’t like the smell of citronella, which is a pity as it’s very good against mosquitoes. Others don’t like wintergreen. Some people love patchouli. That’s why you can just pick and mix any of the essential oils listed below and add them to your spray. So you can make a recipe that keeps mosquitoes away, and you will love the smell of it, too! Does Listerine Work As Mosquito Repellent? Listerine will keep mosquitoes away, but the repellent effect does only work for a very short time. The alcohol quickly evaporates, leaving very little of the mosquito-repelling scented essential oils behind. The concentration of these essential oils is also very low. So as a mosquito repellent, Listerine is not very effective. It will soothe your bites, though. When it comes down to it, there are much better ways to win the battle if you want to keep mosquitoes away. This page lists many tried and tested (and helpful) products. And all of my blogs offer lots of ideas and inspiration for those of you who really hate getting bitten. Getting through an entire mosquito season without one itchy bite isn’t easy. But by knowing mosquito habits, and what they love and hate, you have much less of a chance of getting one!